There are several different antifungal preparations that are used to treat various fungal infections. They come as creams, sprays, solutions, shampoos, medicines to take by mouth, and injections. The length of treatment depends on what type of fungal infection you have, how severe it is and if you have any other health problems - for example, problems with your immune system. Some courses of treatment can be as short as a few days (for example, for vaginal thrush). Other courses can be as long as eight weeks (for example, for ringworm infection of the scalp). Forcan 200 mg infusion belongs to class of antifungals called triazoles. 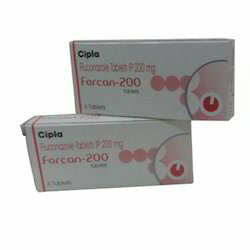 Forcan 200 mg infusion acts mainly by preventing the growth of fungi. It interacts with chemicals inside the fungus and prevents the synthesis of an essential component of fungal cell membrane (ergosterol); this results in leakage of cellular contents from fungal cell, ultimately killing the fungi. Looking for Anti Fungal Drugs ?